Sennheiser HD598 review | What Hi-Fi? In the past we've raised an eyebrow at the brave colour choices for headphones, (such as the Phiaton MS300s' gleaming red finish) but these Sennheisers take things to a whole other level. A high-risk combination of beige leather with polished burl-wood accents seems designed to evoke memories of fondue sets, Austin Princesses and the three-day week – at least among British consumers. Retro or risible? You decide. Let's presume you're digging the looks – what else do you need to know? 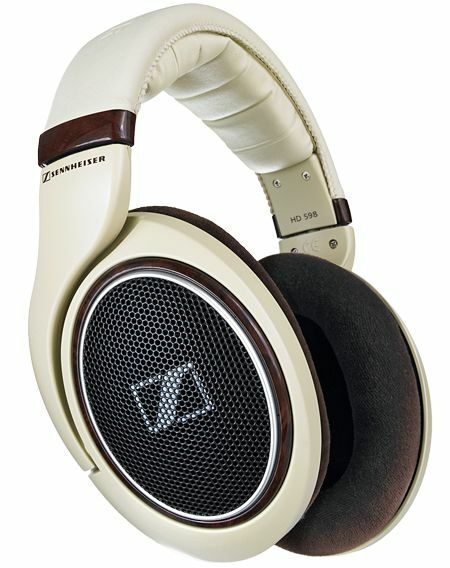 Well, the Sennheisers put the emphasis squarely on stationary, indoor listening, more so than similar rivals. A hefty, 3m cable terminated in a 6.3mm jack (3.5mm usage requires a substantial adaptor) is a strong hint. The open-backed (and leaky) configuration serves as confirmation. Get the HD598s on your head, though, and you may well decide you're perfectly comfortable where you are – they're beautifully snug in situ, grip firmly without clamping, and the velour pads cushion nicely without overheating. Given the strong visual statement the Sennheisers make, a listen to some plush mid-'70s music seems appropriate – and with an uncompressed copy of Steely Dan's high-gloss Pretzel Logic playing, the HD598s serve up a presentation of considerable breadth. Separation is excellent, and there's a stack of detail available even at modest volumes. Low-frequencies are broad-beamed and adequately textured, with a nice positivity to the entry into, and exit from, individual notes. At the opposite end, treble sounds shine benevolently. There's plenty of breathing space in the midrange for vocalists to express themselves, and the HD598s integrate and organise every element confidently. A switch to the considerably more demanding Beethoven – The Symphonies by Gewandhausorchester Leipzig under Riccardo Chailly rather exposes the Sennheisers as paper tigers, however. These are, at times, explosive recordings, brimming with drama and tension; the HD598s simply don't have the dynamic brawn to deal effectively with them. For all their insight, refinement and easygoing nature, they're short of the deep-breathing attack required to do the music justice. Too much sophistication is just as destructive as too little, and the Sennheisers seem too mild-mannered (or worse, uninterested) to roll their sleeves up and get stuck in. At the risk of appearing glib, then, we reckon the HD598s sound every bit as beige as they look. That's not a bad thing in and of itself – beige is neutral, restful and it doesn't show the dirt like some other colours – but it just won't do where headphones are concerned. Unless you value good manners above all else, you should look elsewhere.